A day of intense strain for the Coalition. The EU vote in the Commons later on is bad enough, because it exposes an area of increasingly acute disagreement between Conservatives and Lib Dems. Then there’s John Hayes taking an axe to wind farms in a speech last night (to a renewables conference – cute!) without telling his boss Ed Davey, which will set off another blistering row over who runs energy policy after David Cameron re-wrote it by accident at PMQs. On top of that there’s the curious case of the Lords row over boundaries that broke late last night – apparently Lib Dems said they would vote for a Labour amendment to postpone the reduction in the number of MPs, which would have precipitated a defeat for the Government: did Nick Clegg know? I suspect we’ve had enough of weather cliches, but think perfect storm: a Coalition that is always finely balanced must navigate three disputes which individually would be enough to prompt crisis meetings of the Quad. A busy day in No10 ahead. But first, wind power. “Enough is enough” when it comes to the onshore wind turbines which have “peppered” Britain, John Hayes said last night. We have full details in our Splash. In a damning indictment of previous Coalition policy, he added that it seemed “extraordinary” that they had already proliferated so far. Mr Hayes’ speech did not happen by accident. It is tempting to conclude that he acted knowing he had high level support. No10 and the Treasury profess surprise, but Lib Dems will be suspicious that the energy minister is being encouraged to steer policy away from wind farms. Which may delight those who say they are a costly and pointless blight on the landscape. But it makes for scrappy looking government. And then there’s the difficulty of the agreements the PM entered into on energy policy with his partners. Will Mr Hayes, who delivered Cornerstone for Dave and is one of the so-called ‘untouchables’, be slapped down? Still, if anything could be calculated to restore confidence, it would be an explanation of Dave’s energy tariff pledge. One duly arrived courtesy of Greg Barker yesterday, who explained that the Prime Minister was speaking about “the intent, not the detail”, according to the Guardian. That clears that up then. As the Times (£) reports, Tarzan acknowledges that his suggestions, particularly with respect to airports and energy, however, “there is an unavoidable need for a decision” and David Cameron needs to make up his mind “pretty sharpish”. Perhaps he has caught the Prime Minister at the right time – with the chest beating being directed at Europe, and probing of Lib Dem tolerance levels in areas such as green energy, Dave seems ready to carry the fight to his opponents at the moment, and the rising chorus of calls for action on London’s airports might give him little choice. Mark Reckless and Mark Pritchard’s amendment requiring the Government to seek a real terms decrease in the EU’s budget has sent an inexperienced team of Conservative whips into a frenzy at the thought of losing a vote to an unholy coalition of Labour and the Tory backbenches. According to the Telegraph , at least 35 Tory MPs will vote against the Government. Yesterday saw an attempt to draw the fire through a rival motion backed by Jacob Rees-Mogg and Peter Bone, with discreet Doiwning Street support, which would “regret” the increase in the UK’s net EU contribution to date, but implicitly allows for a budget rise in line with inflation when it calls on Dave to veto anything else. This already appears to be Number 10’s position, with increasingly thick hints being dropped that the Prime Minister will use his veto. William Hague is among those complaining about Labour’s cynicism, given that the party previously supported rises in the EU budget. Cynical or not, the move has been effective. There is almost no domestic support for an increase in the EU’s budget at a time of austerity at home. The alleged extent of the threats being made by the Conservative Whips Office, the Spectator reports that one MP was even told that voting for the amendment would lead to a vote of confidence in Mr Cameron, speaks of panic in the engine room. Quite a reaction, given the amendment is non-binding. With ministers returning and errant MPs being offered personal meetings with the Prime Minister and Chancellor, the stakes have been raised to artificially high levels. The debate should begin around 4pm this afternoon, expect fireworks. The boundaries dispute is sketchy – James Kirkup has the story (not yet online) – but Tories say they spotted an ambush planned by Lib Dems today in the vote on voter registration. The LDs planned to back a Labour amendment that would have put off the boundary review to 2018. You see the difficulty: voting against the Government is a Coalition no-no. The Government would have been defeated, so today’s business has been pulled rather than risk it. There’ll be time enough to ponder what this tells us about Lib Dem attitudes to boundary reviews. But Tories are wondering what Mr Clegg knew about what his colleagues in the Lords are up to. One for the Quad, no doubt. So says the Mail, who report that ministers in the last Labour government knew about the threat to our ash trees four years ago but “hid behind European laws” in order to avoid taking action. They may be making a bold pitch for the fiscal austerity platform, but it looks like they still have some way to go before they are the party of the countryside. Research by the TaxPayers’ Alliance show that £113m of tax money goes to fund trade union activities, with the largest part devoted to paying public sector workers who perform union duties while nominally at work, City AM reports. It’s back! Milimania, that is. After emerging from conference hailed as the greatest orator since Churchill, Ed Miliband has been on an upward curve. Now he has blossomed into a celebrity, complete with those two sure-fire signs of celebrity status – autograph hunters and a picture spread on Mail Online. 11:00 am: Immigration Minister Mark Harper gives evidence on the EU’s global approach to migration and mobility. House of Lords Home Affairs, Health and Education EU Sub-Committee, Committee room 3. 11:00 am: Release of Heseltine Report on regional growth. Birmingham Town Hall, Victoria Square. 02:45 pm: Transport Secretary Patrick McLoughlin appears before House of Commons Transport Committee on now-scrapped West Coast rail franchise. Transport Department Permanent Secretary Philip Rutnam also appearing Grimond Room, Portcullis House. 03:00 pm: Home Secretary Theresa May gives evidence to the Parliamentary Draft Data Communications Bill Committee. Committee Room 4, House of Lords. SCMP report on premier-in-waiting Li Keqiang’s wife Cheng Hong: Cheng is a leading expert on American nature writing, but she no longer teaches students. SCMP says, “Like many who lived through the Cultural Revolution, Cheng Hong felt she’d had enough excitement to last a lifetime. It was in 1995, while she was a visiting scholar in the United States at Brown University, Rhode Island, that these thoughts crystallised. I know the pictures look too unreal to be true!! 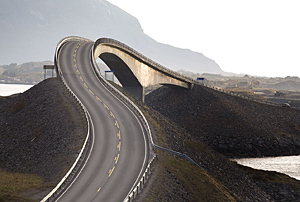 But this the Atlantic Road in Norawy, which zigzags across low bridges that jut out over the sea. 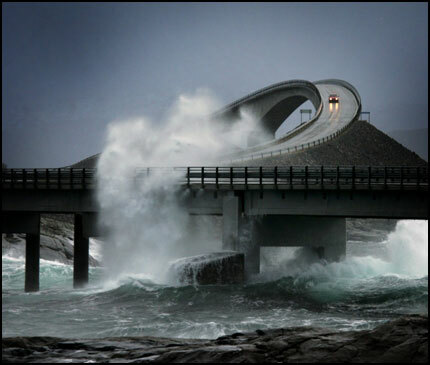 It is an 8-kilometre long stretch of road between the towns of Kristiansund and Molde. 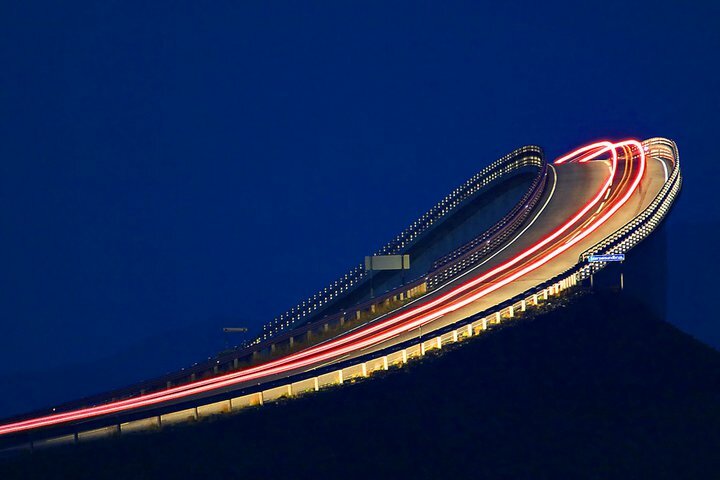 The Atlantic Road has been awarded the status national tourist route because of the architecture of the road and the bridges, and the incredible coastline it passes through. It is reccomended to visit this place during stormy season as it is most dramatic during that time. It is a good place to visit during calm season also, as there is a good possibility that you might spot whales and seals at this splace. Its definitely in my ‘to do’ list to ride through this amazing place! Let me begin by saying that I do not think God made this universe in six days and I also conclude that it might have taken billions of years for evolution to take control of our planet. Thus saying do I concur with science? yes I do. Do I negate the Biblical story, no. I can only assume that thousands of years ago, man did not have the unblinking, revealing nature and reality of the cosmos. In politics, as in climatology, bad weather cannot last for ever. Storm-lashed Tories believe that growth, however fragile, is a sign that the hurricane favouring the Opposition may blow itself out. As Lord Ashcroft confesses to a “surprising burst of optimism” over Conservative prospects, some leading Labour figures worry that it is Ed Miliband’s turn to face a Frankenstorm. In the words of one Ed loyalist: “If the economy is growing, people will say, ‘Why on earth should we let this lot [he means Labour] back in?’ ” Even those closest to Mr Miliband admit that lack of trust on the economy could prove lethal. “That is our central weakness,” says one shadow cabinet member. Nor will it be easy to convince voters that their pain is caused, at least in part, by bankrupt Government policy, rather than by a vital austerity drive. Despite those caveats, Mr Miliband believes that he can trump any kudos David Cameron hopes to glean from a frail, or a more robust, recovery. Already the Labour leader is branding the 2015 showdown the “living standards election”.